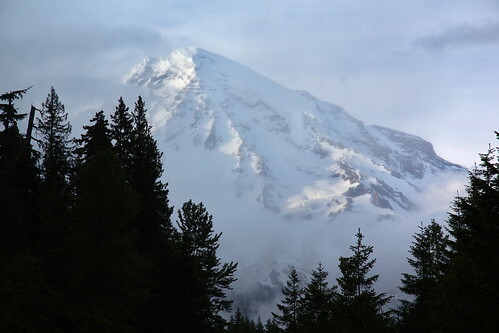 The Mountain in the clouds, a photo by The Bacher Family on Flickr. This was one of those days when I took one look at the view at Kautz Creek as I drove by on my way home... and turned around and the next opportunity, grabbing my camera and sprinting out of the car even as I turned off the engine. I took a whole series of photos as the clouds moved in and out. This is my favorite. Mount Rainier so often looks just like this -- half hidden behind a gossamer veil of mist, beautiful in the evening light.